My goodness, this is a big church! It was rebuilt in the years after the Black Death by Sir Oliver de Ingham, who we will meet inside, and although it still has plenty of Decorated details it is already full of that sad austerity that would inform so much architecture over the next century. 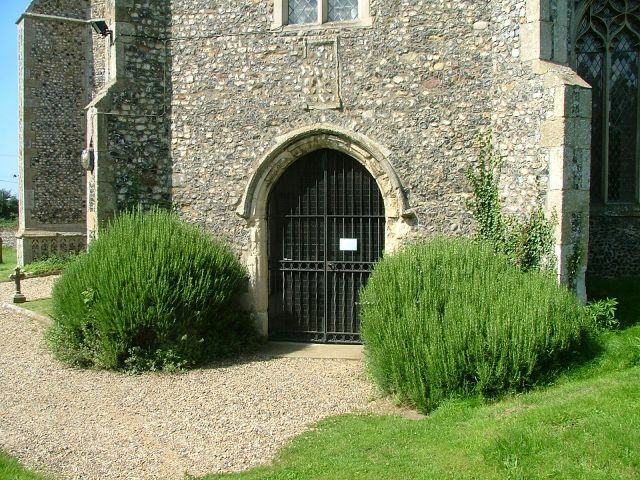 Most serious of all is the great vaulted porch, as big as a house, although it is softened slightly by the great rosemary bushes planted outside. I took a handful to cook with. 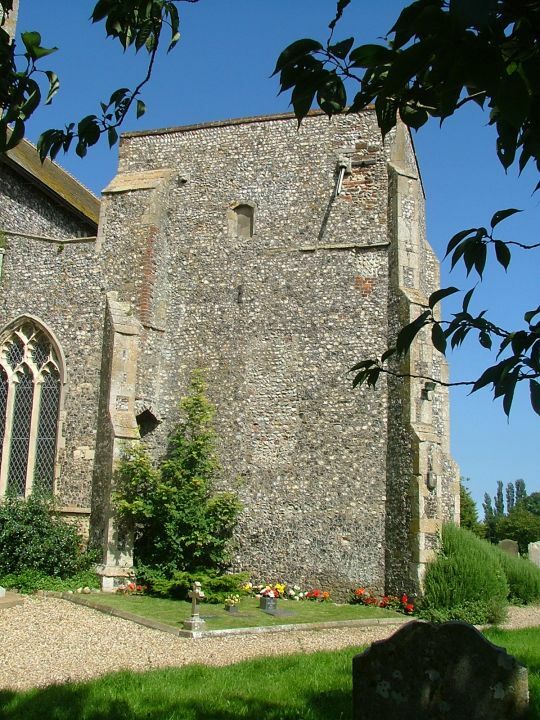 Sir Oliver had designed the church with a college of Friars of the Holy Trinity in mind, and although this foundation certainly started life, by the Reformation a century and a half later it had already ceased to function. 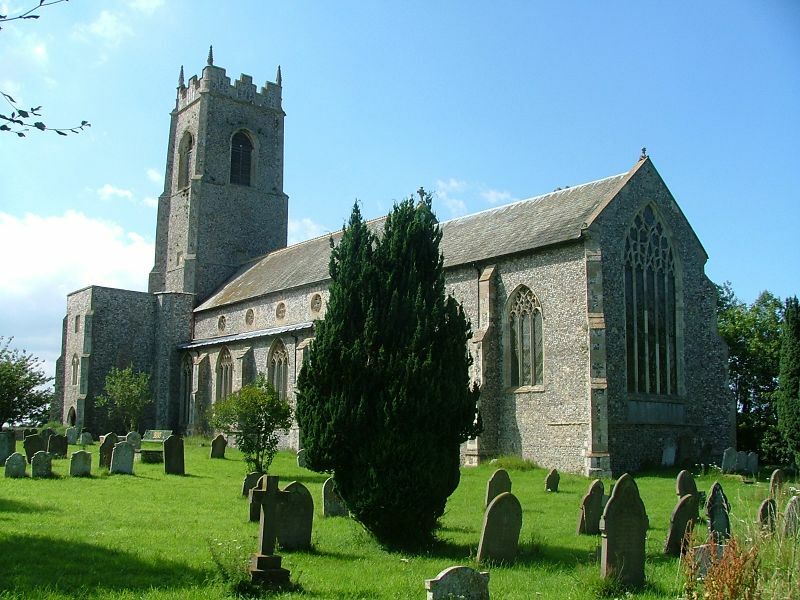 In any case, this order was already in its last days, and never really caught on in England; their main function, the redemption of slaves taken captive during the crusades, was hard to pursue from a remote Norfolk village. Even so, Ingham was briefly the mother house of the order in England. 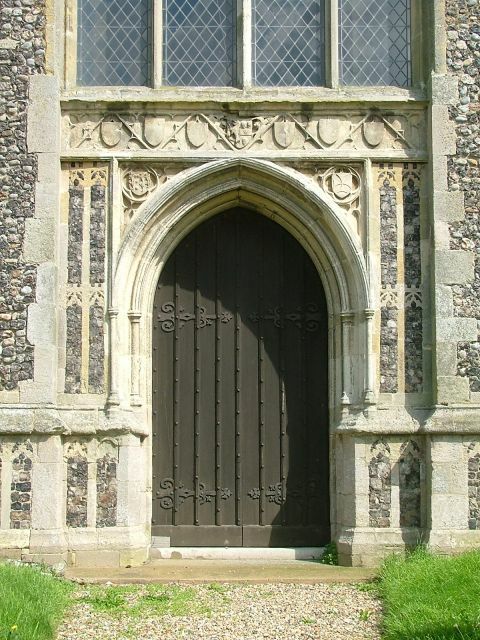 Pevsner noted the full confidence of Decorated architecture in the chancel, and consequently placed it a generation earlier, before the pestilence wasted Norfolk. Ewan Christian seems to have been inspired by this gaiety when he rebuilt the south aisle and clerestory in the 1870s. 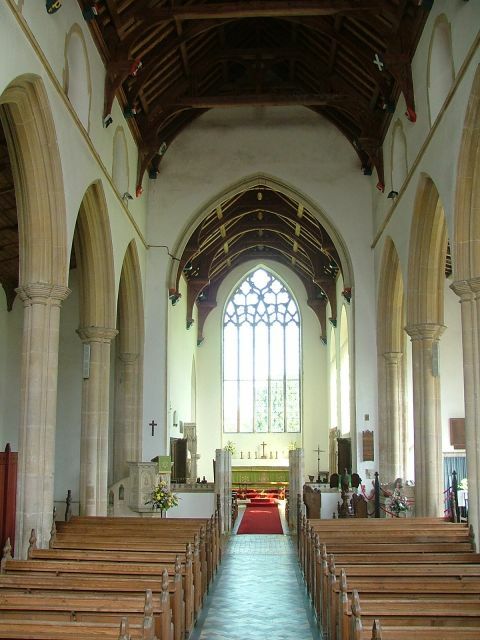 The clerestory is very curious, and on this bright day in the dark interior it was like gazing up at a row of kaleidescopes, all looking very French and not East Anglian at all. Perhaps he had recently been on holiday. 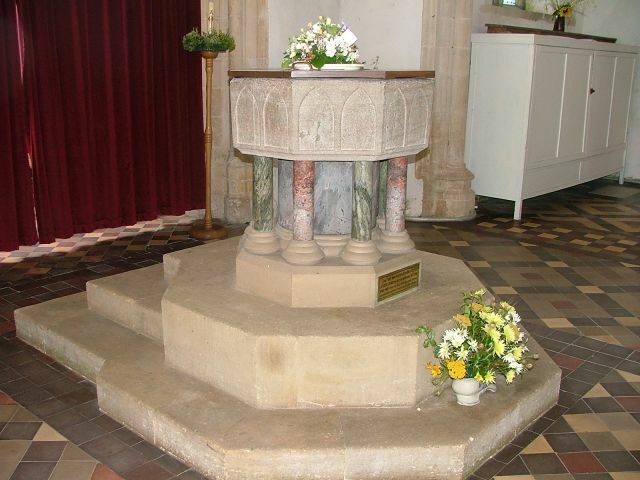 For such a grand church there is a surprisingly bog-standard Purbeck font, and although the Victorians had a go at making it grander, perhaps it came from somewhere else originally and Christian installed it here. 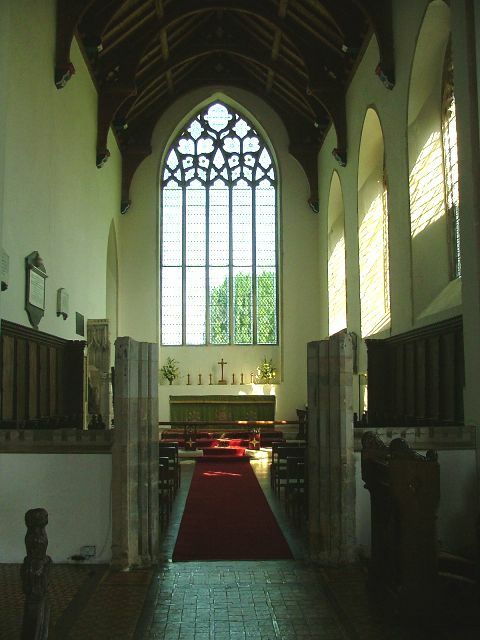 More excitingly, Ingham had a stone screen, and although not much of it remains now it is a reminder that the chancel and nave here would have had quite different liturgical functions. 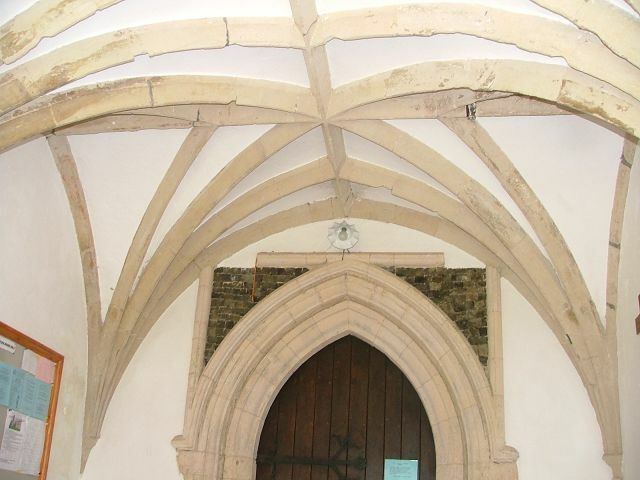 It wasn't necessary for the Friars to know what was going on in the nave, and vice versa. There are two very important memorials here. That in the nave is Sir Oliver de Ingham himself. He lies on a bed of pebbles, sword in hand, two angels holding his helmet. 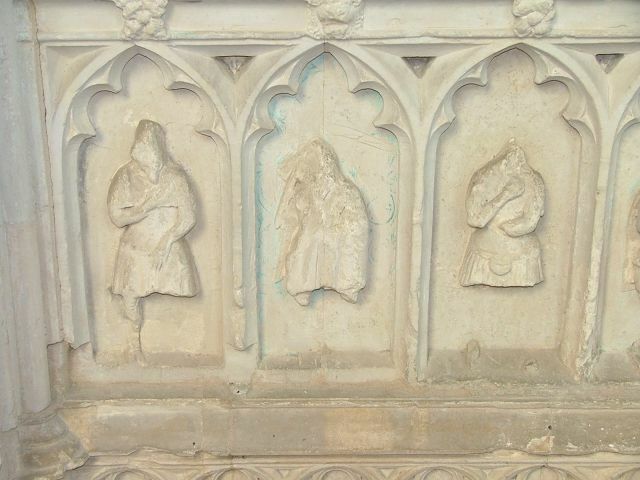 Figures of mourners are set in relief around the base. 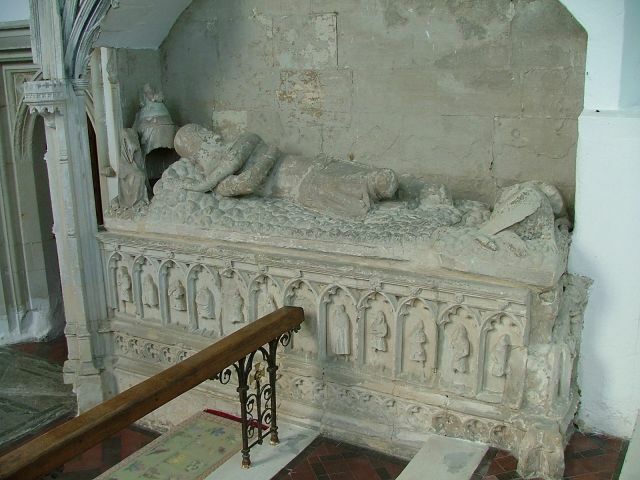 The whole thing is almost identical in form to the one of Sir William de Kerdiston a few miles off at Reepham, although not in as good condition. Interestingly, it was analysed in 1993 using polychromy techniques, and evidence of a rich colour scheme was unearthed. A painting of what it might have been like is on display, and is rather startling to say the least. 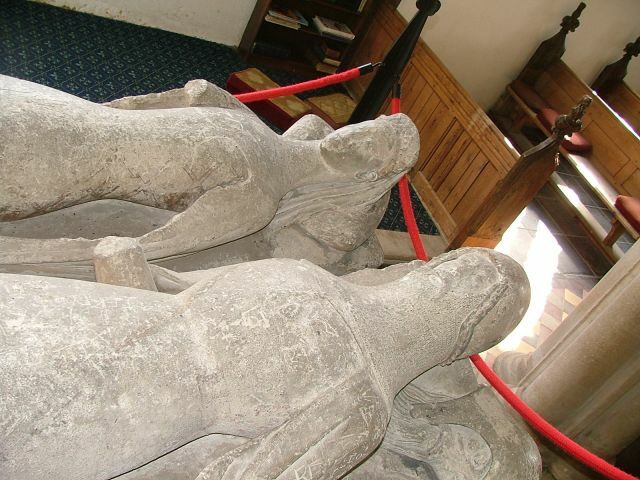 The other, perhaps more striking, memorial is in the nave to the south of the chancel arch. 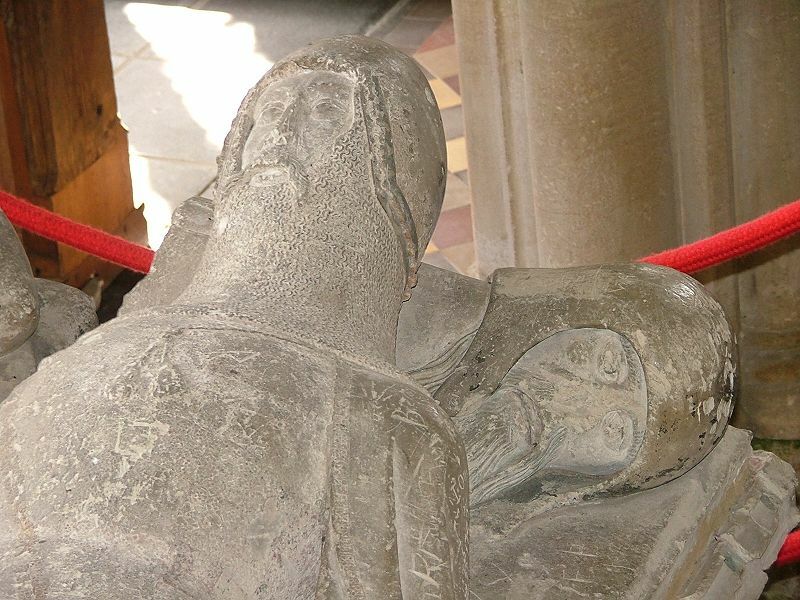 It is roughly contemporary, although it remembers two people of several generations earlier, Sir Roger and Lady Margaret de Bois. 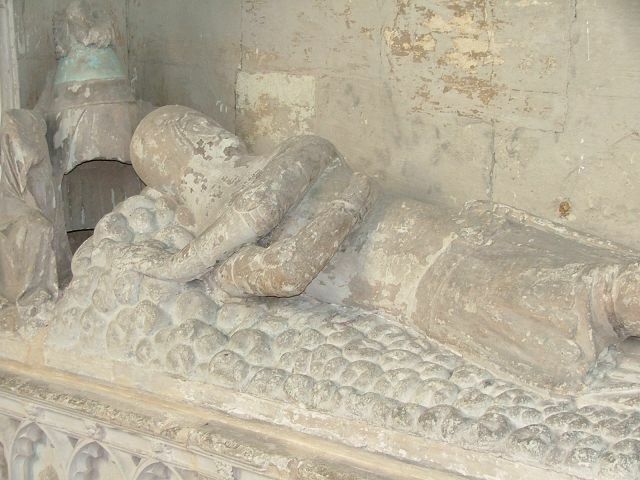 Most curiously, Sir Roger rests his head on a disembodied helmeted knight. 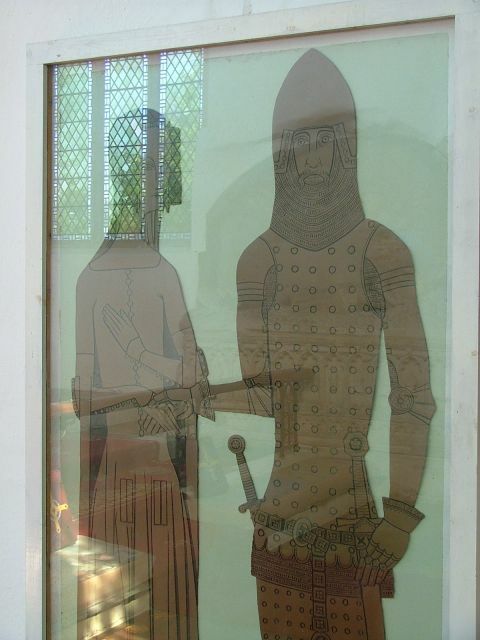 Ingham had some wonderful brasses, but they are pretty much all gone. 19th century records of them survive in the British Museum, and there are replicas on the wall. Apparently, one was to a dog called Jakke. I would have liked to have seen that.